Dhaka Guangzhou Baiyun Checked-in baggage allowance: Business class 3 Pieces/23Kgs-Per Piece and Economy Class 1 Piece/25kgs. Excess baggage will be charged USD 71 Per Piece. Hand Carry-on baggage is maximum 7 Kgs. Guangzhou Baiyun Dhaka Checked-in baggage allowance: Business class 3 Pieces/23Kgs-Per Piece and Economy Class 1 Piece/25kgs. Excess baggage will be charged CNY 400 Per Piece. Hand Carry-on baggage is maximum 7 Kgs. Q: How many flights fly from dhaka to guangzhou everyday? A: There are 2 flights flying from dhaka to guangzhou every day. Q: Which is the earliest flight to take from dhaka to guangzhou? Q: What time does the last flight leave from dhaka to guangzhou? Q: How long is the flight from dhaka to guangzhou? A:The flight from dhaka to guangzhou is usually 5h 30m long.Q: What is the lowest airfare I can get from dhaka to guangzhou in the coming week ? A: The lowest airfare for flying dhaka to guangzhou is BDT. 34500 This deal is available with US Bangla airlineQ: What is the today’s cheapest airfare from dhaka to guangzhou? 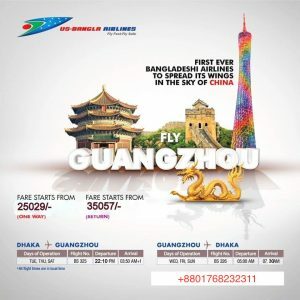 A: You can get the best airfare of BDT 34500 when flying from dhaka to guangzhouQ: Which airlines fly from dhaka to guangzhou?